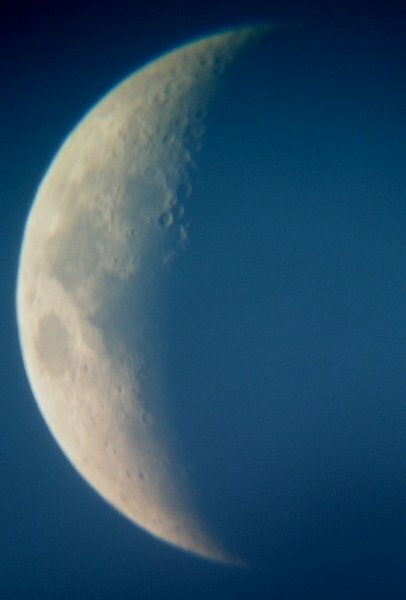 Here is my first shot of the moon (taken 07-30-2006). I finally decided to buy a small telescope (Meade 60EQ-A, a small equatorial refracting telescope, 900mm focal length, f/15). This image was taken with the 25mm MA eyepiece and the camera (my Finepix 4700) handheld directly to the eyepiece. I did not even use a tripod for the camera. I think once I have a unit that allows to attach the camera directly to the telescope I can get more brilliant and sharper images. For now, this image is not too bad for the low-level technique used.